Please note Eisley, wearing her vagabond baby pajamas and looking at me like I'm completely entertaining and/or crazypants. I love that girl. This week has been relatively calm, which is a good thing. I've realized that I've finally gotten into a bit of a routine within my weeks—which is a little embarrassing, considering it took me over a year to feel comfortable in my new role as a stay-at-home-mom. I'm much less stressed and anxious about things, and I'm able to fit much more into each day (without feeling like a complete and utter failure if I can only manage half my to-do list by the end of it). I've closed myself off completely from things that were adding all this extra unnecessary pressure (such as drowning myself in parenting books, blogs, and message boards that only made me feel guilty and less-than) and adding things that I had missed dearly (weekly library outings, always having a book to pick up, and baking). There's always a lot to work through, but I'm feeling good. Super cute outfit! 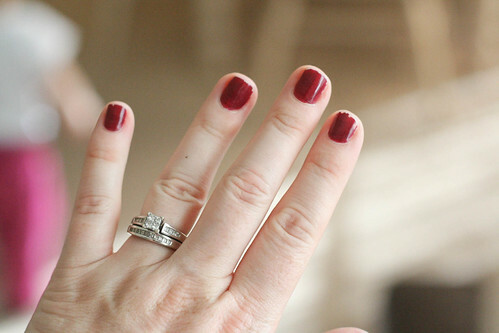 Love your nail polish color...I literally go only a few hours before I get chipped nails. such a bummer. I also love that Eisley is sitting there just looking up at you! So sweet! Love the pants. I tried pants like that, that wear legging type jeans, and I loved the feel of them, but it kind of felt like I was wearing leggings. You know. Not actual jeans. But seeing your pants, even if they're jeans or not, make me rethink getting them. But I do like your hair! Even if it's the same as usual for you. I can't even DO a bun! Well, maybe if I actually tired. I usually just do the same old ponytail, so maybe I should try a bun to be different! Cute!! 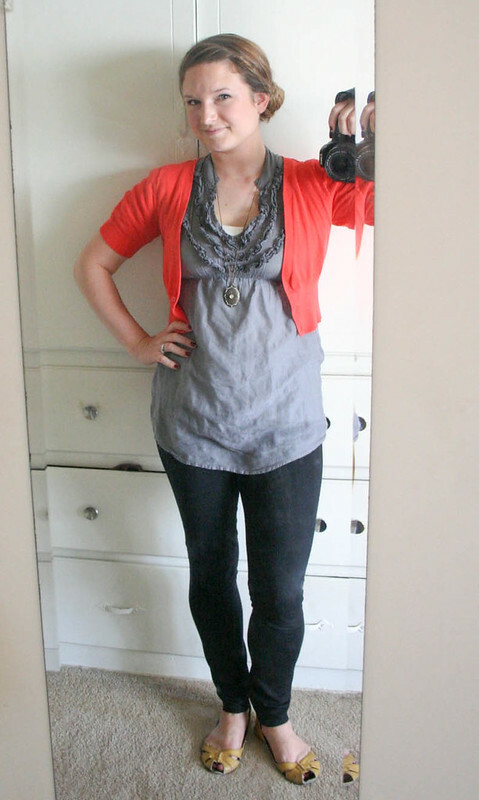 Love the pop of color in your cardigan! 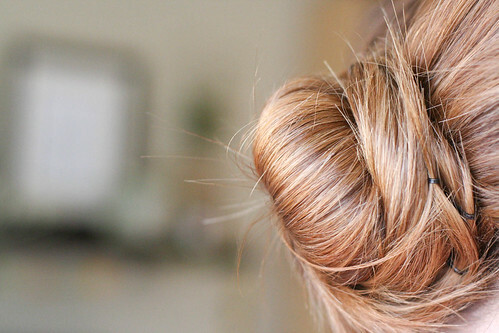 And buns are super fashionable right now so rock it girl! I am finally wearing them and can't wear them enough. It definitely doesn't hurt that it's super easy and saves me like an extra 15 minutes since I don't have to curl my hair! Same thing always happens to my nails. And also... I have that same wedding ring.. only mine is gold. Contemplating on getting it dipped. 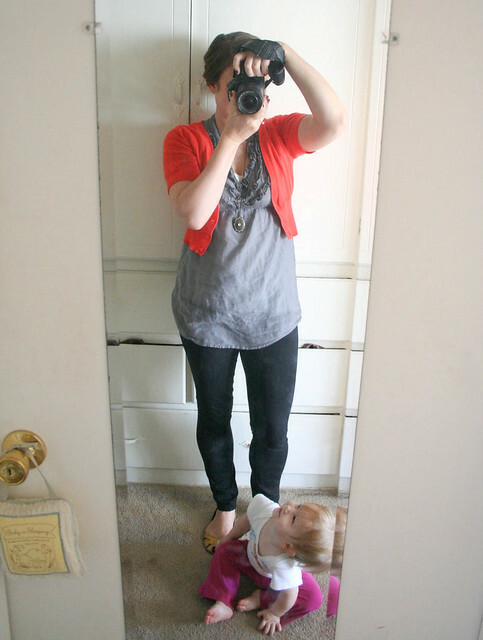 It took me awhile to settle into the role of being a mom let alone being a stay-at-home mom. It takes as long as it takes. Happy to see you happy. I love the picture of Eisley just staring up and smiling at you. Adorable.